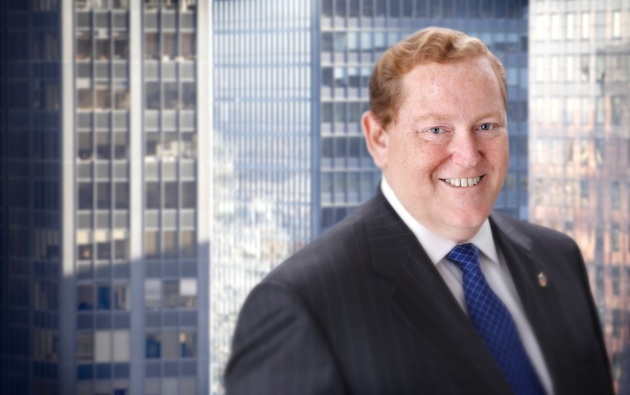 Tributes continue to pour in for Tom Moran, the former chairman and CEO of Mutual America, noted humanitarian, and peacemaker, who passed away at 65 on August 12 in New York City after a short illness. “I have learned with sadness of the passing of Tom Moran, a leader in the Irish community in America who will be greatly missed. In 2015, I presented Tom with a Presidential Distinguished Service Award in recognition of his work for Ireland, on this island and in the U.S., supporting peace, but also supporting education and opportunity. Sabina and I would like to extend our deepest sympathies to his wife Joan, his family and many friends at this time.” – Irish President Michael D. Higgins, in a public statement. “St. Patrick’s Cathedral, which this week celebrated 160 years since the laying of its cornerstone in 1858, was a fitting site for the funeral of a man and the business leader regarded by many as a guardian angel for peace, truth, and justice.” – Turlough McConnell, head of Turlough McConnell Communications. “Tom made a very significant positive impact on Irish American relations, in particular supporting peace in Northern Ireland. My sincere condolences to his wife, Joan, and to his wider family and friends.” – Simon Coveney, Irish Foreign Affairs Minister, Twitter. “Mourning the death today of Tom Moran. Nobody would be more uncomfortable with eulogies – nor more deserving. He was the underdog’s fierce champion – a humanitarian and a rebel. The best of company and the most loyal of friends. Ar dheis Dé.” – Niall Burgess, Secretary General of Ireland’s Department of Foreign Affairs and former Irish Consul General in New York, Twitter. “Tributes to Tom Moran include his humanitarian efforts, philanthropy and especially his significant contributions to the Northern Ireland peace process. His personal support for many of us was invaluable. His open door policy was not as widely known. Tom’s interest, guidance and financial support in no small way was crucial for the success of many.” – Adrian Flannelly, Irish radio broadcaster and Moran’s old friend, to the Irish Voice. “Sad to hear of the passing of Tom Moran in New York… A great friend – full of honesty, candor and wisdom. Authentic advocate for policing and the peace process. Many of us in leadership will miss his support, counsel and humor.” – Chief Constable George Hamilton, Police Service Northern Ireland. “It is with very deep regret that we heard the news of Tom Moran’s death in New York. Tom was introduced to the peace process by Bill Flynn and became a crucial player in his positive involvement with political representatives of loyalism making clear his main aim was a shared understanding of the peace process and building support across all communities. He will be deeply missed. Our condolences to his wife Joan and his wide circle of family and friends… Ar Dheis De Go Raibh A Anam Dilis.” – Gerry Adams, former president of Sinn Féin, in a statement on behalf of party leadership. “Typical obituaries end with a recitation of loved ones left behind by the departed: ‘He or she is survived by…’ In the case of Tom Moran, who left this earth on Sunday, August 12, such a listing would be impossible, because Tom is not only survived by a vast community of loving family, friends, and colleagues, but by countless men, women and children around the world who have been — and will continue to be — touched directly by his love, generosity, and boundless belief in the humanity and dignity of all. Tom was a Concern Worldwide U.S. Board member for more than two decades, and Board Chair from 2001—2017. His relentless commitment to our mission from day one allowed Ireland’s leading humanitarian organization to establish roots in the US. His personal generosity and dauntless evangelism on behalf of the organization set a tone and an example followed by hundreds of others, a community of loyal supporters that has provided a rock solid foundation for innovation, influence, and impact in transforming the lives of the world’s poorest people.” – Concern Worldwide, via website post. “For all those who work to heal lives ravaged by violence, famine and War, may they go courageously forward energized and renewed by Tom’s spirit and enthusiasm.” – Ed Kenney, closing the Prayers for the Faithful at Tom’s funeral. “He was a visionary leader, transforming the company into one of the most respected financial services companies in the nation. Tom touched the lives of so many individuals worldwide, and he was particularly loved by his Mutual of America family. Those of us who were fortunate and blessed to have known and worked closely with him will fondly remember his wisdom, integrity, compassion, caring nature, great sense of humor, limitless energy and a love of life that had a contagious effect everyone he met. He serves as an inspiration for all who knew him.” – Mutual of America’s obituary in the New York Times. “His greeting was always the same – ‘What do you say, Niall – ’ or whoever he was talking too. Right away it tapped him as a listener, not someone who wanted to lead every conversation. That was Tom all right, a force of nature, a force for good, a force for what is right. We will long speak of him.” – Niall O’Dowd, publisher of Irish America and the Irish Voice. “Tom Moran embodied the very best of what Manhattan College stands for. He was a man of tremendous energy and intellect who strove constantly to use his gifts in service to others. Underlying all of his many accomplishments was deep respect for the dignity of the human person, which drove his tireless advocacy on behalf of those in need.” – Brennan O’Donnell, President of Manhattan College. “I was very saddened to hear that Tom passed away. He was a great guy. I met him in 2004 at Irish America Magazine’s Wall Street 50 event and told him I always wanted to March in the NYC St. Patrick’s Day Parade and he made sure I did. Several times I came up for the parade and marched with his group, times spent at Langan’s and Gallaghers’ steakhouse after the parade will be great memories that will stay with me the rest of my life. He also made sure I had tickets for the Cardinal’s mass at St. Patrick’s before the parade and primo seats too. We always spoke or texted each other on St. Patrick’s day if I wasn’t in NYC for the day and I will surely miss this good , good man and friend. His wife Joan is in my thoughts and prayers and I pray that God in His mercy will be kind to her and give her comfort. ‘I have fought the good fight, I have finished the race, I have kept the faith.’ (2 Timothy 4:7) Without doubt this verse sums up the great life lived by Tom. Adios amigo, God is merciful so I know we’ll see each other again, save me a pint of the black.” – Thomas P. Lynch, investment adviser with Sunbelt Securities and an repeated honoree in Irish America’s Wall Street 50, via New York Times’ Legacy Guest Book. “Tom Moran came to visit my daughter’s school in Harlem. The ‘International Academy of Hope,’ a school for children with traumatic brain injuries, most of whom have been left unable to walk, talk, see or speak. . .
As I introduced each child to Tom, he knelt down on the floor in front of each one and was simply present to each and everyone of them. This may sound simple but it takes great courage. In front of these children, one is stripped of all material things and exposed for what they are themselves. When he was finished in classroom one, he wanted to go to classroom two and so continued the visit until he had knelt in front of every single child in my daughter’s school. . .
Tom’s greatest legacy simply cannot be confined to libraries and scholarships named in his honor, fine crystal engraved with his name. No, this would not be what the Irish-Italian immigrant raised in Staten Island wanted. His last request would almost certainly have been: make sure my work for real equality and real humanity continues. Please make sure Tom Moran’s legacy of love and inclusion lives on and on. I need it to and you do, too.” – Aine Carroll’s tribute to Tom, read at his funeral by Bill Moyers. “He was a man who didn’t just give money, he gave of himself, and when he helped someone he made them feel that they were giving him a gift.” – Irish America’s editor-in-chief Patricia Harty. “Do as much as you can, as well as you can, for as many as you can, for as long as you can.” – A well-loved quote from Father Aengus Finucane, founder of Concern Worldwide. Bill Moyers read this quote as part of his eulogy for Tom, mentioning that Tom had often repeated it, and modeled his life after it. Rest in peace, Tom. We were blessed to have you, even if it wasn’t nearly long enough. Slán abhaile. Was in intensive care for eight days and just found out about Tom’s passing. Ireland has lost a great supporter. His passion and genuine sincerity for Ireland was unmatched. Tom RIP, you deserve it.